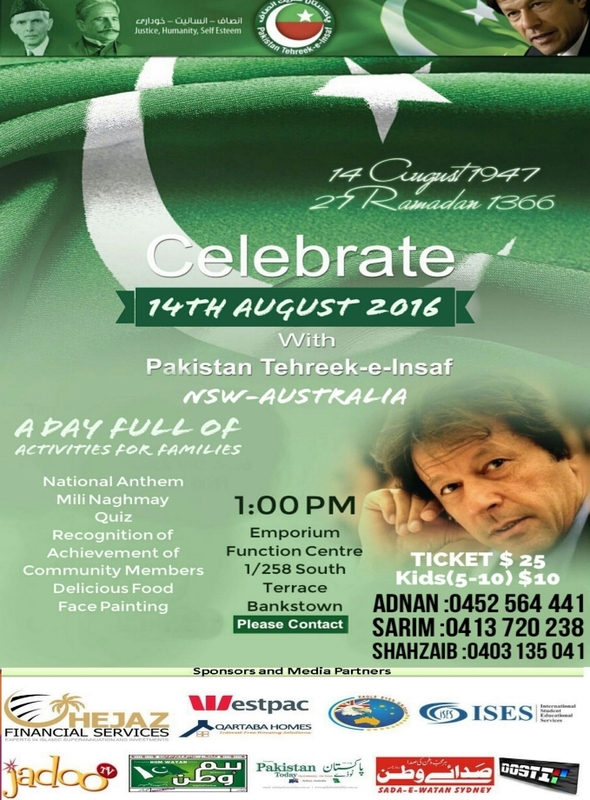 Pakistan Tehreek-e-Insaf - NSW Australia is celebrating the Independence Day on Sunday 14th August, 1 PM @ Emporium Function Centre, 1/258 South Terrace, Bankstown Sydney. This provides an opportunity for uniting fellow community members, PTI loyalists, supporters and friends to come together for an afternoon of engagement that celebrates the 70th Birthday of Pakistan! The event will pay tribute to the struggles of our founding father Muhammad Ali Jinnah, Allama Muhammad Iqbal whose ideology of Pakistan motivated Jinnah to carve a Muslim homeland and a great Pakistani Abdul Sattar Edhi Sahib who devoted his life for poor and destitute of Pakistan.